My attention has been elsewhere. Roger and I are striving to become better human beings and partners to each other. Continuing lessons include staying focused and keeping our commitments to ourselves and to one another… Being in the now does provide momentary relief from the lessons life constantly provides. It’s been nearly five months since Chewie’s “Great Escape and 11-day Outdoor Adventure.” It’s as if he never left, and he seems quite content to live the indoor lifestyle. But we will not be tricked into complacency! And, Roger has kept his word to Chewie: We have not one but three tricked out warm water tanks! In addition to five felines, we are now the caretakers of a variety of warm water fish, two crawfish and two albino African clawed frogs (Pinky and Peetie) . Yes, we have quite the menagerie of fins, flippers and furbies. And, yes, I do have an admiration for alliteration… The tanks are Roger’s primary new hobby. And all the cats do enjoy their new live “television” experience! And life has gone on for our kitties. Throughout all the changes and the passing of time, they remain as they are—beacons of hope, reminders of the present. Still fighting and cuddling. Still puking and peeing. And still remaining lumps of irrepressible love. My promise is to resume posting regularly to this blog. This artistic outlet is one of many varied, creative lifelines anchoring me to this world of color, texture, taste…to this sensual life, brimming with joy, love, grief and sorrow. But a full life, nonetheless. And I’m not yet done…there are still a few items left on my bucket list. But, first, I must find and pet a kitty. The last month of 2011 has turned out to be quite the odyssey. An emotional rollercoaster of regret, sadness, irritation, hope…and gratitude. He just bolted. Chewie got underfoot while Roger was fiddling with the front door, leaving Roger in a daze and Chewie off to God-knows where. We looked for him for most of that Monday, through the neighborhood, hoping to see a glimpse of him hunkering down…but nothing. We were so fearful he ran too far he could not find his way home…or that he met his fate with some other beast or vehicle. By that Wednesday, we posted a lost kitty ad on Craigslist and affixed flyers around our neighborhood. We looked for him continually and hoped to lure him home with treats…but nothing. Was he scared? Upset with us? Lost and hurt? Or…did he just prefer the life of a street kitty?? This turn of events was disheartening but not surprising. Of all the indoor cats, Chewie was the one who expressed the most interest in exploring what was beyond that front door. I guess his curiosity, desire and need to investigate outweighed his desire for safety, comfort and love from his hairless beings. Then, by the end of the first week, our regret and sadness turned to irritation. On Thursday evening, we caught a glimpse of the fur beast just lounging outside our back door! But when we went to let him in, Chewie bolted…again! What the F*%^&*$?! Now we felt incensed and exasperated. Ok, he was not hurt, alone or lost, and we felt relief over that. Now he just seemed to prefer the outdoors? Was Cheiwe afraid to approach the front door because of Sylvester or Orange Kitty? Were we just trying to come up with answers, anthropomorphisng our ten-pound headache, in the attempt to understand the changing circumstances? Even his two older half brothers, Junior and Blackie, eventually returned home after several unscheduled excursions. For nearly a week, I feel asleep praying that Chewie was ok and trying to understand why he wouldn’t come back. Of course, Roger felt horribly guilty for not paying better attention and vowed to make our home more inviting for Chewie by refurbishing the fish tank and stocking it with more fish for the viewing pleasure of all the kitties. Well, we did catch sightings of Chewie several more times. But in the end, Roger resorted to trapping our furbeast with one of our humane traps. Yep. After 11 nights out-of-doors, Chewie came home—a little skinnier and rumpled, but he’s home now. And within an hour of his homecoming, he came out from hunkering underneath the bed and rubbed against his hairless beasts as if nothing had happened, no time at all had passed. And of course our hurt and annoyance just evaporated into wellsprings of gratitude. Maybe in his mind, no time had really gone bye. Wouldn’t it be wonderful to truly and whole-heartedly live just in the moment? One moment you’re inside—woo hooo! The next moment you’re outside—woo hoo! No recognition of the passage of time, and no regret for what is not happening. We higher-level beings are the ones who suffer—perhaps, even by choice—when things do not seem to go our way, or when we do not understand why something is occurring. If we could truly live in the now, would there be any place for suffering, regret and shame? Would we take for granted life’s impermanence and the gifts of love, kindness and friendship? 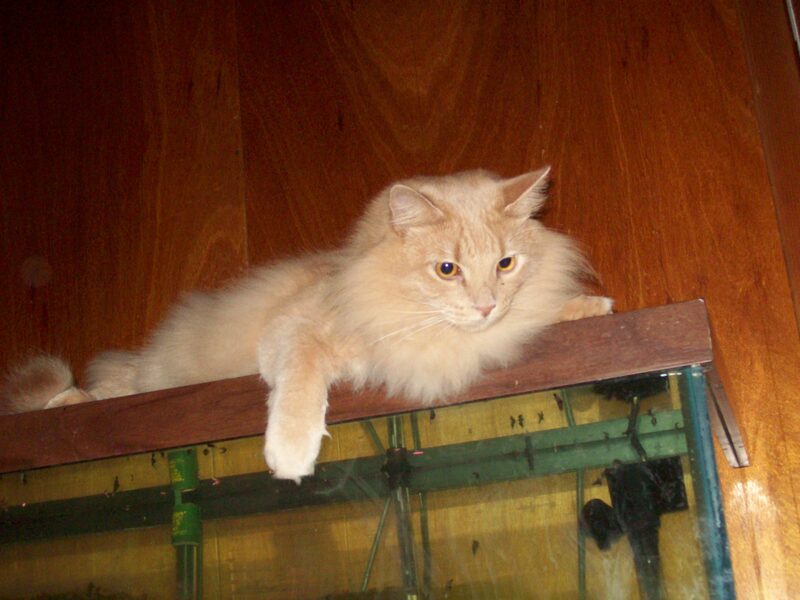 Roger now owes the cats one tricked-out fish tank—the first resolution 2012! He left our lives in the same manner he joined: quietly, without fanfare. Fuzzy was an elderly grey and white male kitty (never neutered!) with these Halloween orange eyes. Initially, Roger and I saw him lingering around Sluggo—the now spayed feral female that allows us to provide for her; more on her story later in this blog—thinking he was just another feral male wanting to get lucky… Then one day, perhaps a year and a half ago, I attempted to pet him. And to my surprise, he allowed it. Not only did he allow us to pet him, he seemed to crave the affection. Who knew?! In his quiet, tentative ways he wanted us to pet him, stoke him, gingerly crawling onto our laps so that we could do more. Which made us feel both very sad and very happy: here was this obviously gracious kitty who was once someone’s pet, perhaps, who had been living so long in the streets. Abandoned, fending for himself. And all he wanted was love and affection. So, we gave him that love. And it was last summer when we realized that he was ill—there were scabs all over his body and some open wounds. Roger took him to several vets with a similar diagnosis: he was dying. Some feline disease, and since he was so old—we figured he was over 12 or 13 years—there was nothing much we could do for him. One vet wanted to put him down last summer, but we said no; there was still a lot of life left in the old geezer kitty. Fuzzy still walked and was curious; sniffing and investigating. It was so funny to observe him walking about in his “old man” cat walk… He still ate, drank a lot, pooped. Obviously craved the human touch. We figured that when the time came that he could no longer do these things, we would do the right thing and be with him in the end. But we never had that chance. So, throughout last fall, winter, and this spring, we fed him, and Roger provided a warm, comfortable place in the garage for him to sleep and a litter box, too—so he wouldn’t have to go outside when it snowed. I would check on Fuzzy several times a day to make sure he was ok. When it was sunny, I would find him catching a few rays in the backyard, just enjoying this life… He seemed to enjoy the human-made comfort during the bad weather, but when the weather turned nice, he beckoned to the call of his animal instincts to roam and to investigate. Fuzzy no longer stayed overnight in the garage, but did come in the evenings for us to feed him. He still seemed fine, in good spirits. Friday, June 10, 2011, was the last time we saw Fuzzy. In the evening, he meandered back, as was his habit. At different times throughout the evening, he would climb into our laps, and we petted and stroked the elderly kitty who allowed us to share our lives with him. When we went to bed, here was still on the patio, just hanging about as he had done numerous times before. The next morning he was gone, but that was not unusual for him; we figured he would return that evening. But he did not return that night nor any night since. It’s been 20 days. 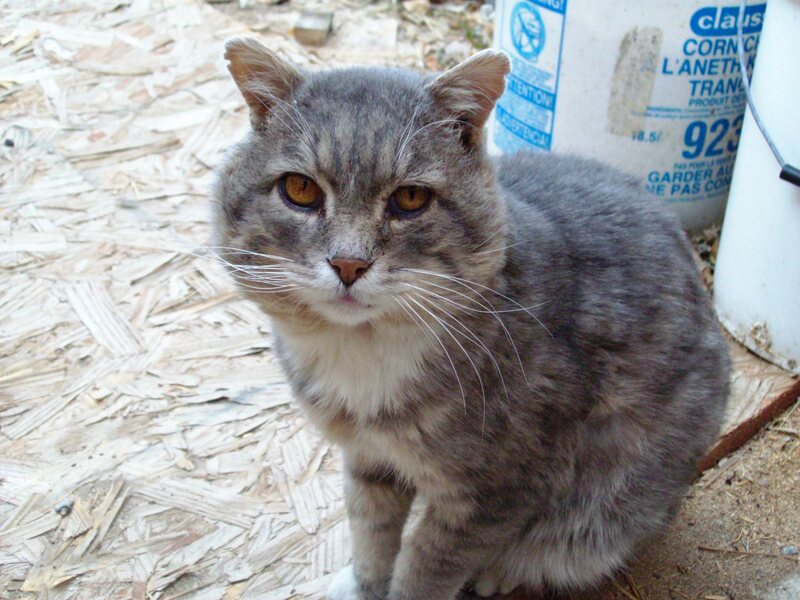 We did look for him in our neighbors’ yards and in the nooks and crannies around the house… For nearly two weeks, I kept checking the garage and the yard, hoping to see his somewhat sad, Halloween-like eyes looking up at me…Fuzzy is gone. Maybe a fox got him; I remember seeing one in the neighborhood. Maybe he knew his time was growing near and found a quiet and comfortable place to make his transition. Maybe the evening of June 10 was his way of saying goodbye. We don’t know. We never will. I feel very fortunate to have known Fuzzy. Yes, we regret not discovering his affection sooner… We regret not taking him to the vet sooner. But we did what we could for him, once we figured out a little more who he was. And we provided a warm place for his final year. Warm not only in physical comfort, but also in love and affection. We loved Fuzzy as we had any kitty that has shared our lives. Perhaps the life lesson with Fuzzy is to appreciate more the moments in time, for they sure are fleeting and not guaranteed. And to let go when it is time to do so. Fuzzy, my friend. Farewell. We miss you. May your eternity be filled with warmth and love.